Controller: LAMD LM87800. NAND Flash: Toshiba 24nm Toggle Mode MLC. Release date: Q2 2012. The Corsair Neutron GTX 240GB averaged just 18.1% lower than the peak scores attained by the group leaders. This is an excellent result which ranks the Corsair Neutron GTX 240GB near the top of the comparison list. The range of scores (95th - 5th percentile) for the Corsair Neutron GTX 240GB is 41.6%. This is a relatively wide range which indicates that the Corsair Neutron GTX 240GB performs inconsistently under varying real world conditions. 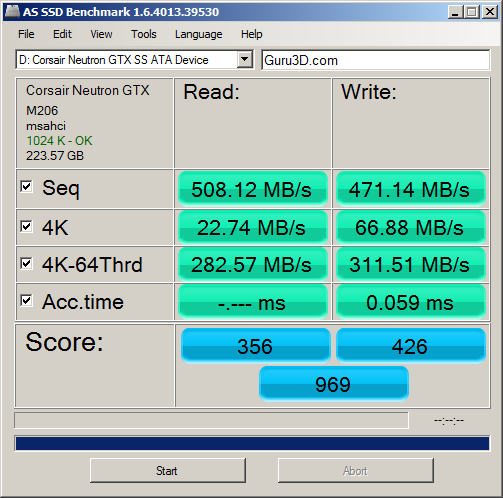 Typical Neutron GTX 240GB Builds (Compare 3,853 builds) See popular component choices, score breakdowns and rankings. A mega review covering every aspect of this drive. Guru3d recommended. 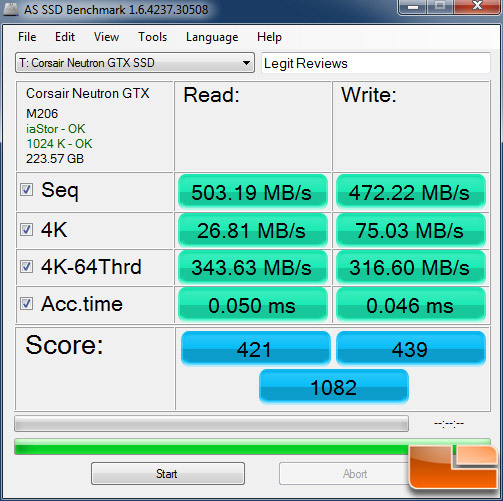 AS SSD Benchmark test results. This is currently one of the best performing consumer grade SSDs on the market. A key advantage is that it doesn't use the sandforce SF2281 controller which has been blamed for lots of bugs in the OCZ Vertex/Agility and Kingston HyperX range of SSD's. On the flip side this drive uses a new controller that some might argue is somewhat untested as yet. Fantastic performance, a worthy successor to the hugely successfull and recently decommissioned Performance Pro Series.